From the 'cool story, bro' files, the other day, as I was skim-reading Michael Lopp's exhaustive advice for the beleaguered frequent international flyer, I found myself wondering if the life-hack your packing advice and artfully arranged photos of suitcase contents are a contemporary phenomena, one of those quirks that will be looked back upon my our descendants in bepuzzlement. I wonder if people 300 years hence will be puzzled by our fixation on packing-well blog posts and spread-out suitcase contents Instagrams. Then I thought - no. Surely wealthy men of parts embarking on their Grand Tours had packing advice. (I doubt they made watercolour sketches of their trunk contents though.) And then I remembered one of my favourite lists ever, from the Hand-book for intending emigrants to the southern settlements of New Zealand (1849). Here clothing and linen lists are set out for the Husband and the Wife, in minimalist and maximalist versions, from tablecloths to pea coats. Unfortunately there's not a good image of the lists available online, but Te Ara has a digitised version of the book's opening pages. Today on the radio I'm going to recap the 2014 TrendsWatch report for musuems - from collaborative consumption to robots. More interesting than you'd think, I swear. I also wrote up my observations - with lots of links - on The Dowse's blog. It never rains but it pours. After ranting last week about photography in museums, here's another chance, courtesy of The Art Newspaper. The Van Gogh Museum in Amsterdam has reintroduced its photography ban, due to complaints from non-photographing visitors and because photo-restrictions from loan institutions were hard to police. I have some sympathy here - one of the reasons cited for reintroducing the ban is visitors' frustration with people taking photos of themselves and their friends in front of the artwork. In a thronged gallery, that would get up my nose too. And I admire the Van Gogh Museum for trialling something and then making a decision based on visitor actions and reactions. TAN surveys the photo policies of the world's ten busiest museums in the article and finds a range of approaches, from the Tate's stance that photography "opens up possibilities of dialogue and engagement" to London's National Gallery's opinion that it "could spoil the visitor’s enjoyment of the art". All of which makes me realise that photography policies aren't just an issue of visitor service, artist's wishes and copyright. They're about how you brand yourself and the kind of institution you promote yourself as being. The Telegraph is running a click-bait series of articles about how to do museums right. Following on from Tiffany Jenkins' call to ban kids (and fluffies), we've got Rupert Christiansen fomenting for the (re)banning of photography in museums. I shouldn't keep reacting to these stories, but I do. The overweening sense of entitlement and NIMBYness that oozes from them drives me crazy. Sure, I don't want my museums "dumbed-down" to attract teens or to be stuffed with tourists in lock-step photographing every work and label (though from Mahara Gallery to MOMA in the past year, I've not seen that kind of behaviour in evidence, unlike the turn of the century, when I worked FOH at Te Papa and certainly did see it). I do want museums to feel special - but I want them to feel like a special part of your everyday life, not a place where you stop being you when you visit. This is why I'd argue, against Christiansen, that most visitors I see these days taking photos aren't revealing that they "don’t know what to do when confronted with a work of art beyond visually registering it: the click is a way of acknowledging its authority and clicking it off the list without having to engage with it further." I'd say instead (and I have, a few times now) that our photo-taking behaviour is often subtle, nuanced, and social. For a different take: the eminently sensible Russell Davies suggests a show on the simple premise Things You Can Instagram. A belated posting of last week's segment - Ai Weiwei's smashed artwork, the V&A's new design collecting policy, and Art in Oceania's recognition with the Art Book Prize. Farao's 'To Sleep Apart' (tagged on Soundcloud, for some incomprehensible reason, 'Salsa'). My new favourite podcast is Song Exploder, in which musicians take one of their songs apart, layer by layer, and tell you how it was made. It didn't hurt that the podcast began with one of my favourite bands, The Postal Service, and 'The District Sleeps Alone Tonight'. Even after being interviewed last year on this topic, I don't have many fully-formed opinions on this topic. Those I do have are inflected by the Lean In philosophy (or as I tend to think of it, the 'quit making excuses' philosophy, but that's mostly because I was uninterested when I read it in the partnering and parenting chapters). I do think frequently about the gender split that I have a hunch is occurring in our industry: women in the marketing / curatorial / visitor services / education / collection management side of operations, men in exhibition management / facilities / business ops (of course, for every example of one you're going to find me another). And New Zealand's cup does runneth over right now with women art gallery (if not museum) directors. Out of the 211 directors included in the AAMD survey, 90 directors were female; women held 42.6% of art museum directorships. Segmented by operating budget, these gender disparities are concentrated in museums with a budget of over $15 million – roughly the top quarter of museums. In this segment of museums, there are fewer female directors than male directors, and female directors earn less on average than their male counterparts – $.71 cents for $1 a male earns. Over on the work blog - some thoughts on a simple audience-interaction project. And how does that make you *feel*? Jeepers, it's been a bit quiet round here, hasn't it? That's because I'm cooking up a new project or four at work, plus working on a chapter for a book that I will talk about one day. In the meantime, an afternoon taken away from work to catch up on the Festival shows round town charmingly turned into a chance to meet Jason Maling, whose work The Physician starts at City Gallery Wellington tomorrow. 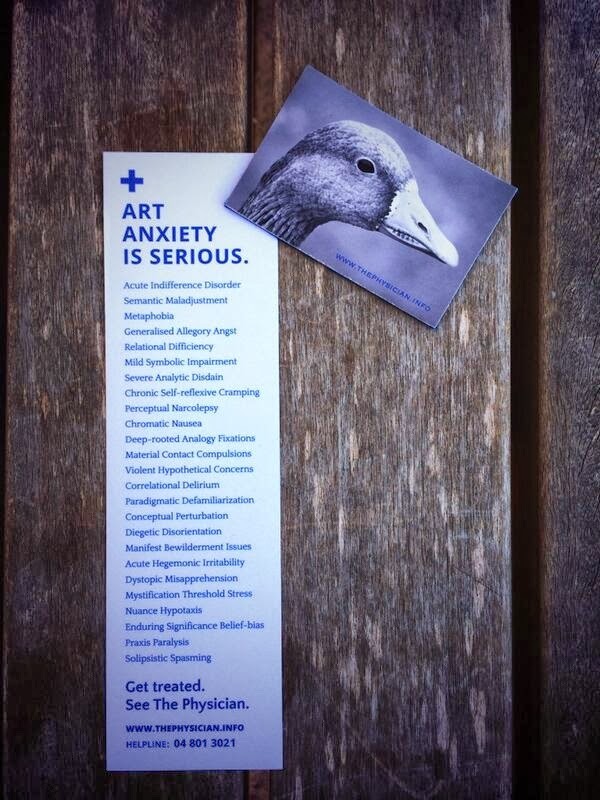 Here, Maling offers treatment for art anxiety, from metaphobia to to manifest bewilderment issues. You can make an appointment with the art doctor on The Physician website. Continuing the theme, Wellington is also about to experience the Moodbank project. From 13 to 23 March you can use an ATM or drop by their office to draw a visualisation or undertake a consultation to capture your emotional state - data that will later be used to map Wellington's mood. Again, you can make appointments through their website. Art - helping you out, for free, since ages ago.